What is lacking in the young field of smart textiles is craftsmanship and skill in making. The fluid knowledge and skills found among traditional craftsperson can play an important role in building smart textiles as a craft form. 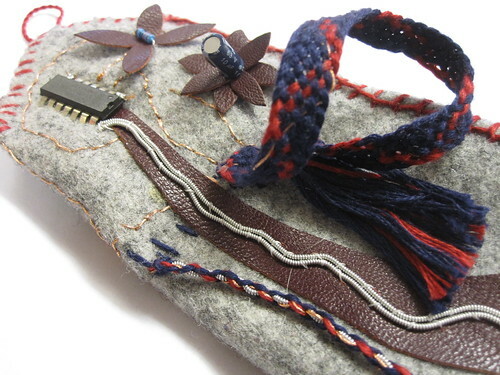 The deep traditional craft knowledge amongst the Sami community is valuable and relevant for smart textiles and through this workshop we hope to explore the aesthetics of circuit making through the craft of tenntråd craft. Tennarmband is a traditional Sami craft practice where tin wire in braided into bracelets. Here tin has been used for its aesthetics and flexibility for braiding etc. Tin is also a conductive material and we are interested in exploring the conductive property of the material through traditional tennarmband crafts. Together with the participants we want to explore new possibilities of traditional materials such as tin in the context of smart textiles as well as see how traditional and new materials can influence and inspire the Sami craft practitioners to create new artifacts and expressions within their practice. During this workshop, participants will be introduced to the field of Smart textiles and the present state of work in the field. We will also introduce them to a simple electronic circuit such as Solarbot circuits where they will learn to use new materials such as conductive yarn and fabric as well as use traditional materials such as tin wires to make a textile circuit that will produce sound or movement when exposed to (sun) light. The result of the workshop is not to develop a final product but to explore what is possible when traditional craft skills and materials are merged with smart materials with properties and how the two can combine to create a new aesthetics and genre of craft artifacts that is reflective of its time. We would also like to engage the participants in a discussion on questions about craft, its role today and what our role as a craft practitioner is in a changing world. March 29, 2012 | Filed under News, Workshops.